A friend, Jill, sent these photos of the Zaandam. She is presently on the Amsterdam on the Grand Asia Voyage. Never having been on the Zaandam, I have had to rely on HAL’s website for information. 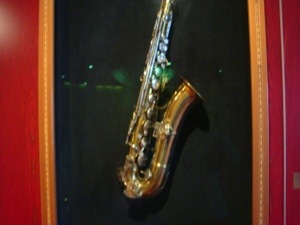 Music is the theme of the ship. From the 3 story atrium housing the Baroque-style Dutch pipe organ to the displays of musical instruments, music is everywhere. 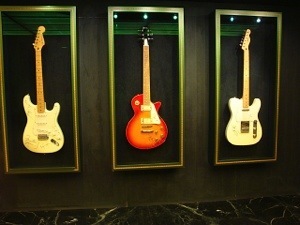 Among the instruments found on the ship are signed guitars from Queen and Rolling Stones and a saxophone which belonged to Bill Clinton. 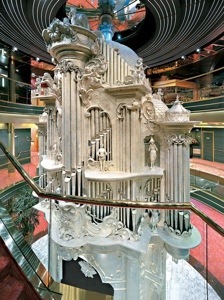 I plan to take the self-guided art tour as I have on every ship, a delightful way to spend a sea day. You can download the tour from the HAL website or borrow an iPod from the librarian in the Explorations Cafe. The ship was dedicated in May, 2000. Its ship registry is The Netherlands. The passenger capacity is 1432 and crew of 615. Adding the Zaandam to my list of dam ships: Amsterdam, Prinsendam, Westerdam, Eurodam, Rotterdam, Veendam, Volendam. 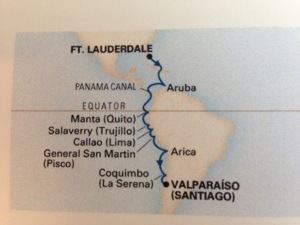 This 17 day voyage is basically a repeat of the ports of the 2012 Grand South America and Antarctica Voyage which was so delightful. A friend and former cabin mate Joe booked this trip and asked if I would like to join him. Wanting to try out my 5 Star status, I agreed. The ship is the Zaandam, on which I have not cruised previously. I embark in Fort Lauderdale and disembark in Valparaiso, Chile. The voyage continues to Buenos Aries and most of the passengers are booked for the entire trip. We have confirmed early dining with a requested table size of 6. There are 3 formal and 14 smart casual nights. 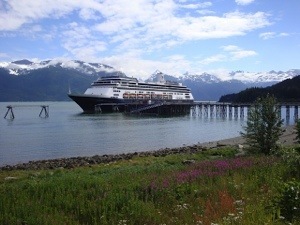 In an effort to save on airline costs, I opted to take one of Holland America’s specials. The times are not great, but my daughter actually figured that I will be paying myself $80 per hour to sit in airport lounges! My flight to Ft. Lauderdale begins on Delta Airlines in Jacksonville at 8:50 a.m. Continues to Atlanta, arriving at 10:04 a.m. and continuing to Ft. Lauderdale at 12:25 p.m. where it arrives at 2:14. I have the HAL transfer service to the ship which leaves at 4 p.m.
My return flight is on American Airlines. I have the HAL transfer service from Valparaiso to Santiago. My flight leaves there at 9:35 p.m. and arrives in Miami at 4:25 a.m. the next day. I leave Miami at 7:55 a.m. and reach Jacksonville at 9:15 a.m.